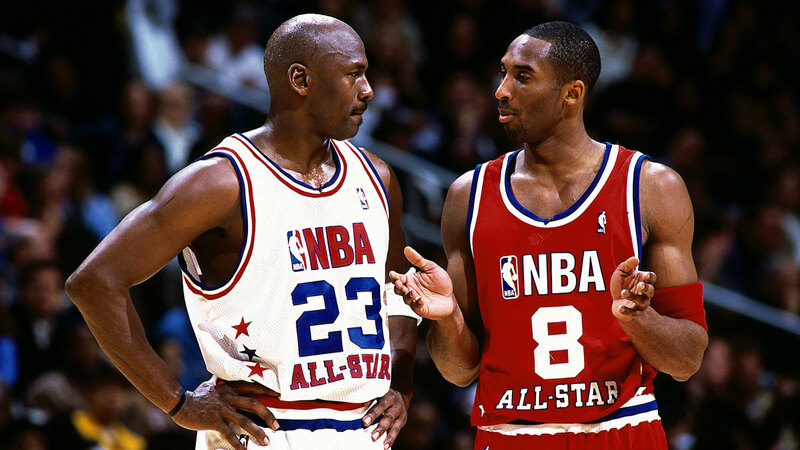 If you ask most fans of the National Basketball Association, LeBron James and Michael Jordan are probably the two most popular NBA players of their respective generations. There's a topic that tends to strike a nerve in many basketball fans, yet, it's a topic that many have grown tired of hearing debated. As someone that straddles both part of the fences when it comes to this topic, I can somewhat sympathize with those that have grown tired of this debate. However, I am also one of those fans whose own personal opinion on this topic keeps me talking about it with others. You could call it a guilty pleasure of sorts. Being someone that grew up during the 80's and 90's, I'll admit being a bit more partial to the NBA of old compared to today's NBA. You can call it getting older or maybe not wanting to forget about my childhood, but the NBA had a different feel to it back then. For me, that feeling has been gone for quite sometime. I still appreciate today's NBA however, which is why I can honestly see why the argument of who's the better player between James and Jordan in their primes continues to rage on. A now retired Michael Jordan is 22 years LeBron James' senior. Even in the unlikely event that they happened to play one-on-one today, a still in his prime LeBron James would likely defeat a 52 year old Michael Jordan. I'd go even further and say that he would probably do it in a fairly easy fashion. We'll never know which player in their prime was the best, however, one thing I'm personally sure of is whose legacy will reign higher in my eyes when it's said and done. For me personally, LeBron James will never have the impact nor legacy of Michael Jordan on the game of basketball. Yes, I indeed said legacy because contrary to popular belief, there are still athletes out there that care about the legacies they leave behind when they're done playing. Although I'm more partial to Michael Jordan, I want to acknowledge that LeBron James is an amazingly gifted player that has accomplished much in his career. The goal here is not to bash, but to give personal insight on why I feel that LeBron will always be a step behind Michael. I don't expect everyone to agree with me on this topic, nor I am I an expert. I'm just a regular fan giving my thoughts. Free agency in today's NBA is much more different than previous years of past. When you take a look back at the NBA during the 80's and 90's, a good portion of the superstar caliber players spent most if not all of their careers with the same organization. A legendary name like Earvin "Magic" Johnson was associated with the Los Angeles Lakers, just like the name Larry Bird was known throughout his career for being a Boston Celtic. While star NBA players of the past played together on the same teams, many of these players were drafted by and developed into stars by the organizations they played for. This is a practice that no longer holds much weight in today's NBA. Players like Kobe Bryant and Tim Duncan are becoming increasingly rare. These are examples of players that spent their entire career with the same organization. When you take a closer look at LeBron James' career, you'll notice that besides his first seven years in the league with the Cleveland Cavaliers, he has played with a plethora of current superstar players. During his tenure with the Miami Heat in which he appeared in four straight NBA Finals, James played alongside both Dwayne Wade and Chris Bosh. It can be argued that both Wade and Bosh were top ten players in the NBA at that current time. As a member of the Miami Heat, LeBron James did accomplish his goal of winning an NBA title. In fact, he accomplished it twice, which is a feat that should be admired since it's difficult to win back to back titles in any sport. Now take a moment and imagine what it would have been like if Michael Jordan decided to leave Chicago and team up with Magic Johnson and Larry Bird. This thought alone gives me the impression that there wouldn't have been much competition in the NBA if those three had decided to team up back then. 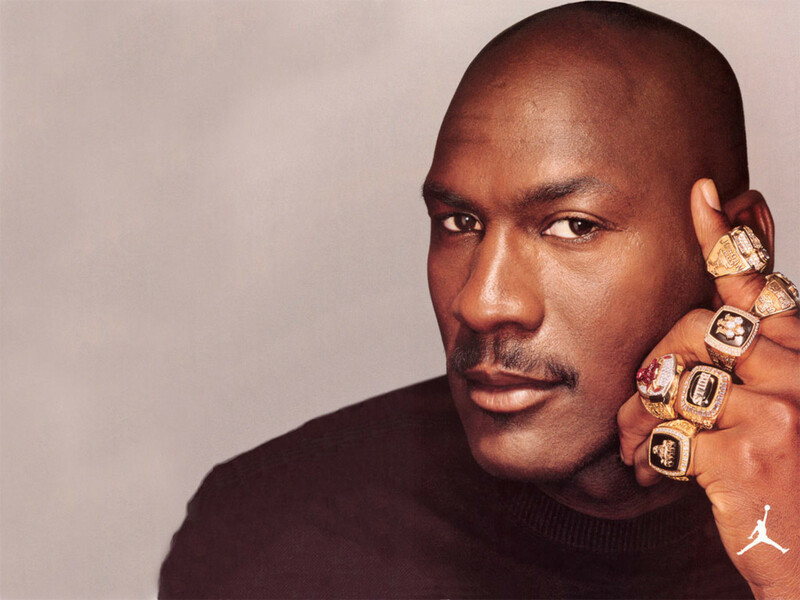 Michael Jordan won six NBA titles with the Chicago Bulls, but those teams weren't comprised of a slew of star players. Those teams consisted of players that brought individual pieces that were built around their star player; primarily through draft picks. Of course there were free agents brought in along the way, but those free agents were guys that helped provide a void to help get the Bulls over the top. While I do recognize that the goal for NBA franchises and players is to win a championship, the idea of top caliber players talking among each other in the off-season and making deals to play together doesn't appeal to me. One of the biggest arguments I hear in regards to LeBron James leaving Cleveland the first time was that he didn't have any help. If I recall correctly, didn't LeBron help lead the Cavaliers to the NBA Finals in 2007? Although they were swept and lost in the finals to the Spurs, the fact that the Cavaliers made it to the NBA Finals proved that they only needed a few more pieces to get over the hump. I believe that the majority of NBA players are fairly arrogant. While arrogance is a trait that I don't like or condone, I suppose its understandable considering the amount of press, fame and stardom these players receive. 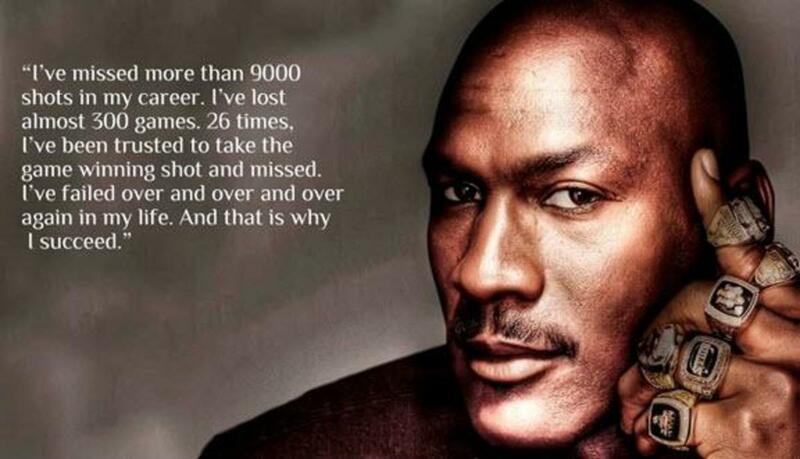 During his time playing in the NBA, Michael Jordan was thought of as being arrogant by many of his critics. You certainly won't get an argument from me on that point. Jordan may have indeed been arrogant, but I feel that he also had a certain level of humility that helped him strive to become better. I don't know LeBron James personally, but I feel that humility is a trait that he lacks to a certain extent. Think back nearly five years ago when James joined the Miami Heat in 2010. 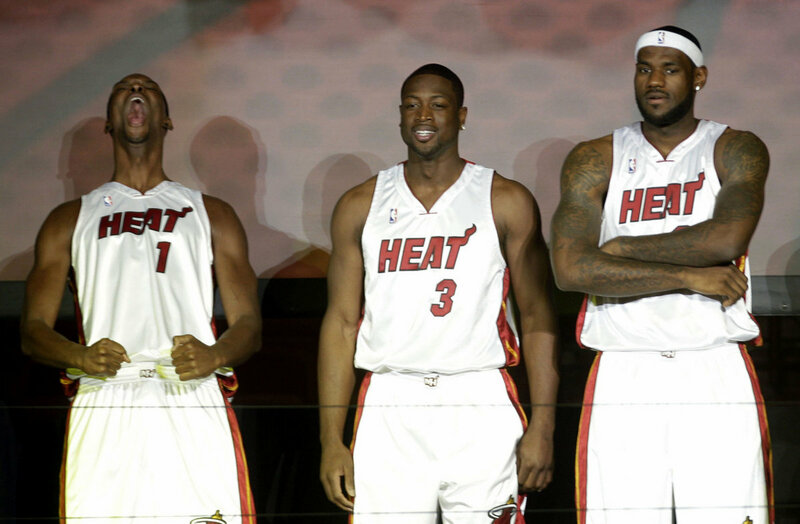 When the Miami Heat's "Big Three" was unveiled, LeBron James predicted a dynasty of multiple championships to come. Keep in mind that these guys had yet to even play together, so whether or not there would be any chemistry between the three was still undetermined. Yet, we saw what I viewed as an overly arrogant LeBron James already predicting a dynasty. Confidence is a trait that every professional athlete should possess, but LeBron's outright arrogance at the time really deflated his public image to many outside of Miami. The entire spectacle of where James would be playing after becoming an unrestricted free agent, along with leaving Cleveland was where he lost me. Looking back at history, I do not ever recall seeing an elite NBA player having an entire television special to announce where they would be playing the following season. Michael Jordan's path to becoming a winner in the NBA wasn't an easy one. During the 1980's, the NBA's Eastern Conference was primarily dominated by the Boston Celtics and Detroit Pistons. Jordan was a young player at that time, and the Chicago Bulls was a franchise that was in a phase of building. By the late 80's, the Bulls had become a playoff contender in the Eastern Conference. Jordan and the Bulls failed several times in getting back the Pistons and Celtics, but I feel that those losses helped make Jordan a better player. I'm taking a guess at making the following assumption, but I think that Michael Jordan's humility towards the game of basketball is one of the reasons why he won six champions in a 10 year span throughout the 1990's. I think that Jordan felt that no matter how much success he obtained as a player in the NBA, he knew that there were always improvements needed to make his game better. One of my favorite quotes from Michael Jordan goes: I've missed more than 9000 shots in my career. I've lost almost 300 games. 26 times, I've been trusted to take the game winning shot and missed. I've failed over and over and over again in my life. And that is why I succeed. You can be a confident person, but still have a degree of humbleness to you. Michael Jordan spent the biggest portion of his playing career with the Chicago Bulls. The only time that Jordan wasn't in a Bulls uniform as a player was at the tail end of his career with the Washington Wizards. As great of a player and athlete as LeBron James is, I'm not entirely sure how loyal he is when it comes to playing for an organization. It has already been established that LeBron James is willing to play with other star players, but he has also given many the impression that he's willing to go from one organization to the next in order to win. Throughout history, many players have left organizations to put themselves in better positions to win. However, I do not expect someone of a Michael Jordan or LeBron James caliber to do this consistently. Players of this caliber are regarded as being representatives of the franchise they're playing for, and we expect them to carry themselves accordingly. LeBron James' loyalty was questioned by many when he decided to leave the Cleveland Cavaliers organization back in 2010. Since James is an Ohio native, the move to leave the Cavaliers was viewed as a sign of betrayal by many. Now I personally don't feel that James should of left Cleveland, but if he felt like the team wasn't going anywhere with the group of guys they had, then I can somewhat understand his reasoning for leaving. Now lets fast forward a bit to the 2014 NBA Finals. LeBron James and the Miami Heat found themselves playing for their third straight NBA title, which is a huge accomplishment in its own right. Miami would go on to lose the series 4 games to 1 in what many considered to be an almost embarrassing fashion to the San Antonio Spurs. Following the defeat to the Spurs, LeBron James decides to pack up his bags and go back home to Cleveland. I personally feel like he could have helped out his image by staying in Miami, and showing that he wouldn't up and run when times get hard. I realize that professional sports is a business, however, certain levels of leadership and loyalty are expected from players of a certain caliber. Imagine how Michael Jordan's image would have looked if he decided to leave the Bulls when they were struggling to even make it out of the first round of the playoffs during the 80's. Charles Barkley, Karl Malone, and Patrick Ewing are all great players that spent the majority of their careers with the same franchise, but never won a title. People don't look down upon athletes that are loyal, even if they retire without winning a title. There have been some that have floated around the idea that James could possibly leave Cleveland again if he doesn't get the results he wants. A defiant James has stated that he wants to be in Cleveland for the long haul. However, it would be understandable if most people decided not to trust a guy who has shown in the past that he'll go wherever he needs to go in order to win. Who Has Had The Greatest Impact On The Game Of Basketball? For me, regardless of how many MVP's and NBA titles that LeBron James wins throughout his career, he will never have the legacy nor impact on the NBA that Michael Jordan has had. I acknowledge that LeBron James is an incredibly talented player that deserves to be in the Hall of Fame someday, but some of his career moves have not sit well with me personally. Since I enjoyed what I consider to be the glory days of my childhood so much, I'll admit that I'm a bit more partial towards Michael Jordan, as well as the era of the NBA that I grew up on. Despite that, I will give LeBron James his just do when it comes to his impact on the game of basketball. James has put an imprint on the sport of basketball that is just as equivalent to Jordan's back in his era, but when it comes to legacy and being remembered, there's a difference from my perspective. 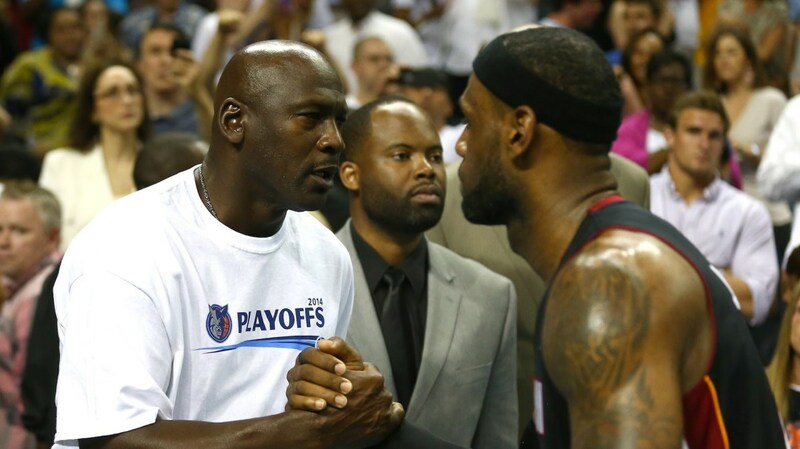 The talks of whose legacy will be greatest among James and Jordan will likely continue for years to come. However, no matter how you try to shape and cut the debates, its extremely difficult to compare two players from different eras. Michael Jordan's legacy with the NBA has already been cemented, so there's nothing left for him to prove. LeBron James is still in his prime, and clearly has some more good years left in him. Although LeBron James will never have the level of impact on the game that Michael Jordan has had from where I see it, he is indeed forging his own legacy before our eyes. Whether his legacy comes out for better or for worse will be up for you to decide. I hate the usual arguments. Or even statistics if James surpasses Jordan in any way. I would rather WATCH the game, and you will see a clear and massive gulf between Jordan and James. Talk about teammates, competition, rules, whatever. 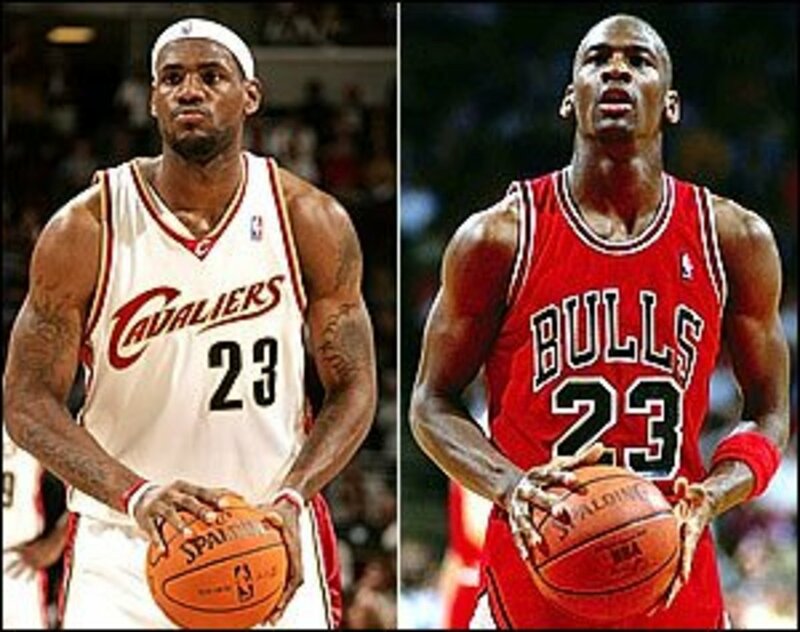 Watch the two of them, Jordan is vastly superior than James. Most of James scoring involves a lumbering charge straight to the hoop. Plus you can talk about adversity but James never overcame his, Jordan did, all star teammates or not. I don't know all the stats. I do know that from time to time you'll hear "Lebron just surpassed Jordan on ...."
But, regardless of the numbers, when I think of great players, Lebron never comes to mind. That is, when I think of someone flying in for a dunk, I picture Jordan, when I think of someone who fits or fills my imagination with what an NBA athlete should be , I think Jordan. Mind, you, I was never really a fan of Jordan. In his day, I liked other NBA players. The point being that Lebron will never gain the long lasting adulation of NBA fans that Jordan has and will continue to have. He simply lacks the aura, that intangible that cannot be described in words or measured in stats. When I think of Lebron, the words that come to mind are insecure, narcissist, envy but not greatness. I guess for me, the stats are just one part of the whole. It's like anything else in life, there will always be someone with better numbers - be it money, IQ, etc. But, a lasting legacy has to be more than just that. Hello, fellas, I have a question that I think will help explain why MJ will always be greater. Is Lebron James going to be among the greatest basketball players of all time or the greatest athletes of all time? While Espn gave it to Ali, Michael Jordan came in second place for the greatest athlete of all time. But in my view, Espn was paying tribute to Ali when they gave it to him over MJ. MJ is the most popular athlete of all time. No player in any sport has had the impact on their sport as he did. Lebron would not eclipse Tom Brady in terms of his generation's top athlete. I am not saying this to hate on the guy, he is a beast and perhaps the most dominate. But he will fall in the line with Wilt, Shaq, and Kareem. He will be seen as one the greatest and among the discussion of greats basketball players. But he can never eclipse the legacy of Jordan. @Andy NBA, I never said Jordan was the "best ever". Again, I'm talking about legacy and impact left on the game of basketball. Of course the dunk contest is an exhibition, but it's still one of NBA fans favorite competitions. I do agree with you that Wilkins was robbed in one of them. I see your point however, and I hope to one day read an article from you on why you feel that Jordan isn't the greatest. Take care. Don't "hate" Jordan but do find reason to provide clarity on the mythology that Jordan is universally, authoritatively, without question, "the best ever". He is but ONE of the best ever, and many other players have the credible right to be considered as such. On the dunk contest point, while we're at it Wilkins was robbed and Jordan should only have one "title". But you realize we are talking about an exhibition contest for dunking. Not exactly an indicator of "greatness". @Andy NBA, I acknowledge what you're saying about the different eras and the media, but I have to disagree with you in regards to LeBron having more clutch plays than Jordan. Yes I did watch the NBA Finals this season, and LeBron deserves all the praise and honor for how he played. I also have to disagree about the dunk contest. In the 80's and 90's, the star players made the dunk contest one of the NBA's top highlights. LeBron had been saying for years that he was going to get in, and he never did. I don't know why you guys seem to think that I'm taking anything away from LeBron in regards to how talented he is. I mentioned various times in the article that he is a great player, as well as a great guy off the court. This is about legacy on the court, and my opinion on it. If you happen to disagree with me on that, that's fine, but it honestly sounds like you all either hate Jordan, or you're just huge LeBron fans that want to anoint him as the best that ever played. Lebron played in a different era as far as media attention. Jordan was protected and elevated by the league despite a lot of character and public relations flaws. In contrast, Lebron (like Wilt) is skewered constantly. Lebron has a comparable number - if not more now - of clutch / key plays / scores in big games in comparison to Jordan and he is nowhere near the end of his career (although past his prime now). In case you missed the last finals - did you see his performances in games 5, 6 and 7 against the 73 win Warriors? No team had ever come back from being doen 3-1 let alone against a monster juggernaut like the Warriors. Jordan's Bulls never faced anyone like that let alone accomplishing anything like that. @janmichaelong, Yes, I agree with you on the clutch factor. That's actually one of the few flaws LeBron has. As great of a player as he is, he rarely finishes down the stretch of a game like Jordan done consistently. I also agree with you about him never joining the dunk contest. I never really understood why he never chose to participate, especially considering how well in done in the high school dunk contest he competed in years ago. I disagree with the 3 point shootout, however. I never viewed LeBron as a three point shooter. @Tom, What exactly does that have to do with this topic? Michael Jordan had more of a clutch gene than Lebron. How Lebron performed during the Celtics series before he first left Cleveland was just sad. Also I am disappointed Lebron never joined the slam dunk contest and the 3 point shootout. Jordan joined both contests and help elevate the profile of them. LeBron didn't quit basketball to play baseball (or serve a suspension) . @Jason Bischer, I agree with what you said about Jordan. The guy never folded, nor was he afraid to put his team on his back. I have much respect for LeBron. He's a truly great player. Thanks for viewing and giving your feedback. Michael Jordan would take control of games. Such a dominate player and in my eyes, the best ever to play the game. 6 for 6 in championships! Gotta respect LeBron though, best player in the world at the moment and dominates this era. Good article. @Andy NBA, Thank you again for reading and providing some great commentary to think about. Cheers! Thanks for the note. I respect the tone in which you are posting and appreciate your points. I understand what you mean about Lebron. The reason I wrote that is because it's not really of any significance to judge different players against each other's legacies. To me, regardless of what the mass media, ESPN and NBA would like people to believe - Jordan's legacy is very complex - as will be Lebron's. The successes had to do with MJ's teams too and not just only him alone - and the negative parts had a lot to do with him individually (attitude, protected by the media/league for pretty bad stuff that's still likely kept quiet, marketed by the league for business reasons, etc.). For my own assessments and how I look at players, I look at what a player did in different situations and not only the years their "team" was good enough as a whole to win it all - as that skews things quite significantly in my opinion. For example, MJ and Wilt were nearly always individually dominant during their primes (arguable who was better, but not a helpful comparison really as their positions/eras/teams/needs/etc. were very different) - but their teammates, coaching opportunities, injuries, luck, and most importantly their opponents - gave them different post-season complexions. Lebron is going down a path more similar to Wilt - never good enough because he's so big and strong that he "should" win all the time, and if he doesn't he's a "loser". I don't buy that kind of thinking as there is context - usually the opponent and how good that team is tells a lot of the story, combined with the teammates the "star" plays with and how good they are, are they injured, etc. The point I was trying to make is that Lebron taking outmatched teams as far as the Finals twice with CLE (and made it close the 2nd time) is frankly much more impressive than what MJ ever did when he didn't have a stellar Bulls squad behind him. That's not a quick and tidy "championship count" - but it is the counterpoint to how championships are truly not the only indicator of a player's worth and contributions and achievements. Loyalty to a franchise is understandable but a very loaded issue rife with questionable soundbite like commentary. Yao Ming played on one team and Shaq was passed around from ORL to LAL to MIA to PHX to BOS - but there is no question when discussing the two players and what they did/were. On Rodman, I don't know how much more he "could have been" given his skills and size - because all he was is perhaps the best rebounding forward in NBA history - quite a feather in the cap. 5 titles on the Pistons/Bulls. Incredible defense. As we know, there are no stats for boxing out, closing out a defender, providing help defense, reading the play, disrupting the opponent's flow, making important plays, etc. Those are the things Rodman did and why he was so successful. I guess we are just different in whether the personality and antics hurt his career or not. I think it honestly made him very eccentric and rubbed some the wrong way - both in the game and in the general public/media - but his achievements, skills, etc. are undeniable. @Andy NBA, You made some very valid points that I agree with. The way I see it is that it all comes down to a person's opinion of who they think will have the greater legacy. I know that it may come across as if I don't see LeBron as a credible great of the game, but that isn't the case at all. He's a great player, and easily one of (if not the best) athlete that we've ever seen play the game of basketball. The league was much different back then compared to now. In my personal opinion, the competition was much more stiffer back then compared to now. When you look at the Eastern conference now for example, there are maybe 4 teams that could even better considered viable contenders, if that many. I measure a lot of my critique by championships, as well as loyalty to a particular franchise. Plus, I preferred the game of basketball much more back then than I do now. That said, I will not refute any of your assessments, but I'll just stick to the reasons I mentioned why I feel LeBron's legacy will never be that of Jordan's. As far as the Rodman statement, I do understand that there's much more to basketball than scoring. Dennis Rodman was a great player, defender, and rebounder. I liked him as a player, but you have to admit that his personality and antics hurt his career a lot, and hindered the kind of player he could have been. Like I said, you provided some great in-depth information. Thanks for your feedback and voicing your opinion. Lebron is a great player. He is also his own player in his own way leading his own journey. I will say he's done a bit more than MJ has if you look at how far he has been able to carry far outmatched teams (basically his CLE years) - and has won 2 titles with many finals appearances. His legacy - even if he wins 10 titles total, will always be "different" than MJ. Whether that is a good or bad thing is up to any person to decide for themselves. MJ is one of the greatest ever and is of course reasonably considered a GOAT type player (along with Wilt, and others as well). But I disagree about the "parity" to which MJ refers in the video. Of course 3 championships in a row, and 6 overall is very impressive for the Bulls, and would be impressive in any era for any team. But, there is always context. It was done in a much bigger league - for example there were 10 teams in the NBA during Wilt's first title season (1966-1967) - fewer teams and fewer roster spots - so only the absolute best of the best filled out rosters - which is why lots of teams had more all-stars per capita than today - there is still only 1 All Star team per conference and it needs players to fill it lol. 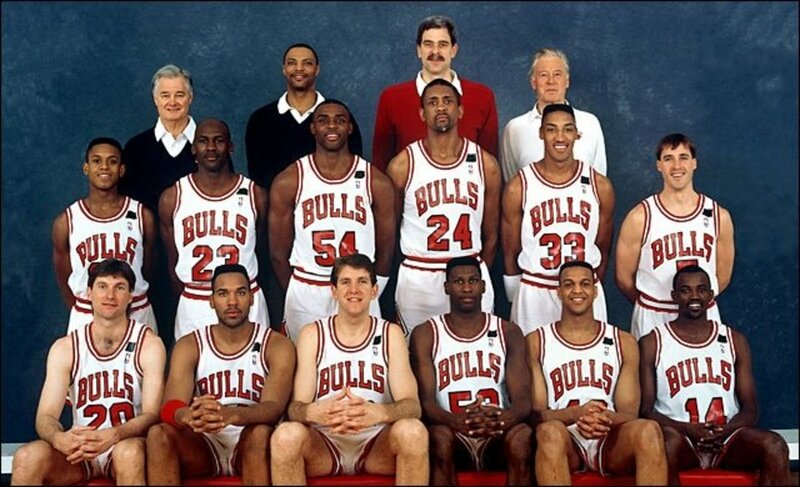 The 1990s featured many more teams - the Bulls first 3peat had 27 teams in the league; and the second 3peat had 29 teams. Which means there were many more roster spots available to more players. There was expansion. The league had nearly tripled in size - while average height increased by about an inch since Wilt's time and average weight by about 10 or so pounds. The proof is in the pudding - MJ's teams never came close to facing a team anyone would honestly consider an all-time great team in NBA history. And this means that if a front office COULD somehow put together a great club (which the Bulls did, that featured the best player in the league (MJ) and another, at worst, top 5 player in the league (SP), along with great supporting casts during both 3peats) - then that team would have an enormous advantage over nearly, if not all, opponents. One needs to simply look at the rosters of the Bulls finals opponents - none compare when combining the # of HOFers, TOP50 players, supporting casts, etc. In fact, it's not exactly a coincidence that the Bulls rise happened to occur just as the Lakers/Celtics/Pistons runs were winding down in decline - because in the 1980s, the Bulls were not a contender - in fact losing 3 straight times in the playoffs to the Pistons in the late 1980s - after MJ's Bulls had 3 straight years of sub-.500 regular season records, 2 first round playoff sweeps and a 3rd near sweep in MJ's first 3 seasons "leading" the Bulls - a 1-9 playoff record! Where was the killer instinct and mentality to win and rise to the occasion for those first 6 years of failure? Why did they not have a record above .500 during the regular season and why did they not win their first playoff series until Pippen and Grant showed up in MJ's 4th year? Valid questions. Nobody was as good as the Bulls were - and in that environment - once you have MJ and Scottie - it would be nearly impossible to counter that in a league with 27-29 teams. On that note, to state Rodman could be replaceable is not a very credible statement. The man was on 5 title teams, and contributed in very important parts of the game (rebounding, defense, intangibles), and is a sure-fire first ballot HOFer. In fact, his Pistons teams kept the Bulls down in the 1980s - and when he joined the 2nd 3peat Bulls - that gave them 3 HOFers on ONE team - all 3 of whom still produced and played at elite levels consistent with their best years in the league. Scoring is but one part of the game. @slappywalker, I agree with you about Kukoc. He along with Drazen Petrovic and Vlade Divac kinda set a precedent at the time for foreign players playing in the NBA. I never viewed him as a superstar like I did Petrovic, but he was a great sixth man. I can see how you or anyone else viewed Rodman as a superstar. He was definitely a great rebounder and defender, but I never viewed him as a guy that was absolutely essential to a team. As good as he was, he could have been replaceable in my opinion, and his personality and attitude at the time didn't help. But you're right, he did play a key role in helping both the Bulls and Pistons win titles. I'm really not a LeBron hater. I have a lot of respect for him as a man. He's a family man, that seems to live a fairly straight and narrow lifestyle, which is commendable with how athletes are portrayed today. He's also a great player, but I wish he would've stayed in Cleveland originally, or at least didn't make a spectacle of deciding to go to Miami. Thanks for your feedback. @Larry Rankin, You won't get an argument from me on that. LeBron James is a great player, and he'll definitely be in the Hall of Fame someday. I just feel that Michael Jordan's impact on basketball will always be greater. I agree that the Bulls teams definitely had plenty of role players beyond the ones I mentioned. Kukoc came over late, but he was pretty good compared to what the rest of the league had to offer at that time. We'll have to agree to disagree on Rodman being a superstar. He might not have scored much, but he was the league rebounding champ the whole time he was in Chicago, and he made Defensive first team for two years there. You made some real good points though. It was good to see someone present it with some depth instead of just hating on James for the sake of hating on him. In my lifetime I have never seen as impactful a player as Michael Jordan. That said, like him or hate him, James is damn good. @slappywalker, The only one you mentioned that I would consider a superstar is Scottie Pippen, and even he developed into the player he was under Jordan's tutelage. 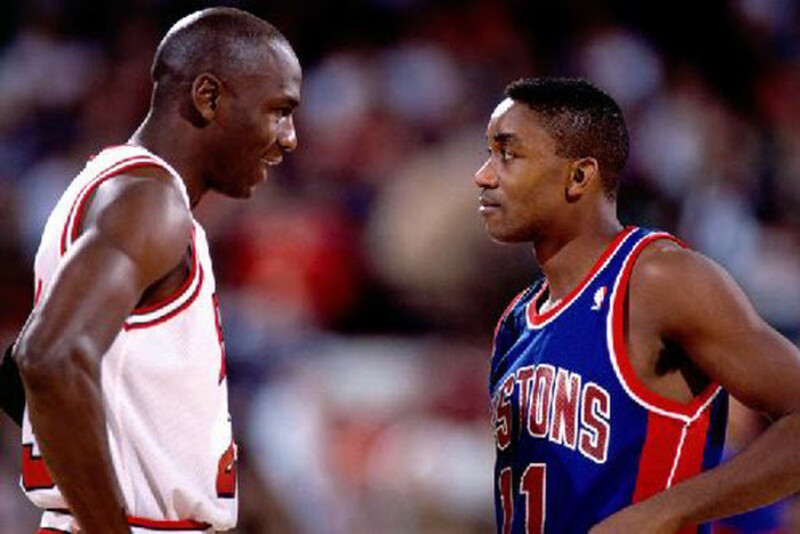 Also, besides Rodman, Pippen and Kukoc both started their careers in Chicago. Neither of them were free agents that came over later. Those Bulls teams were stacked, but not with all-star caliber players. They had the right players for their roles and positions. Michael Jordan played with Scottie Pippen (arguably Top 5/definitely top 10), Dennis Rodman (best defender/rebounder), and Toni Kukoc (best 6th man) at the same time. I still don't understand why people act like he never played with other superstars. He may have never left Chicago due to free agency, but he definitely had a stacked team for at least half of those titles compared to the rest of the NBA.